It may come as no surprise that 60% of people diagnosed with Parkinson's have disrupted sleep. To add insult to injury, poor sleep has been found to impair cognition and most PWP in a recent study believe it has the biggest impact on their overall wellbeing. Disrupted Sleep and Parkinson's: Chicken or the Egg? So, which comes first? Does disrupted sleep raise your chances of developing a neurological disorder like Parkinson's? Or, does Parkinson's Disease lead to poor sleep? The evidence is suggesting that likely poor sleep contributes to the development of neurological disease, but having a neurological disease then causes poor sleep. The bottom line: If you have a diagnosis of Parkinson's, it takes a focused, targeted effort to get a good night's rest. If you've landed on this page, know that the 5 products listed below are fantastic at helping you reach a more restful state of sleep. However, if you're simply layering them on top of a poor sleep-routine, you'll likely be spinning your wheels. Once you've taken a serious look at your bedtime routine, made all the recommended changes, and still have trouble dozing off, you may be at a place where you need some extra help. 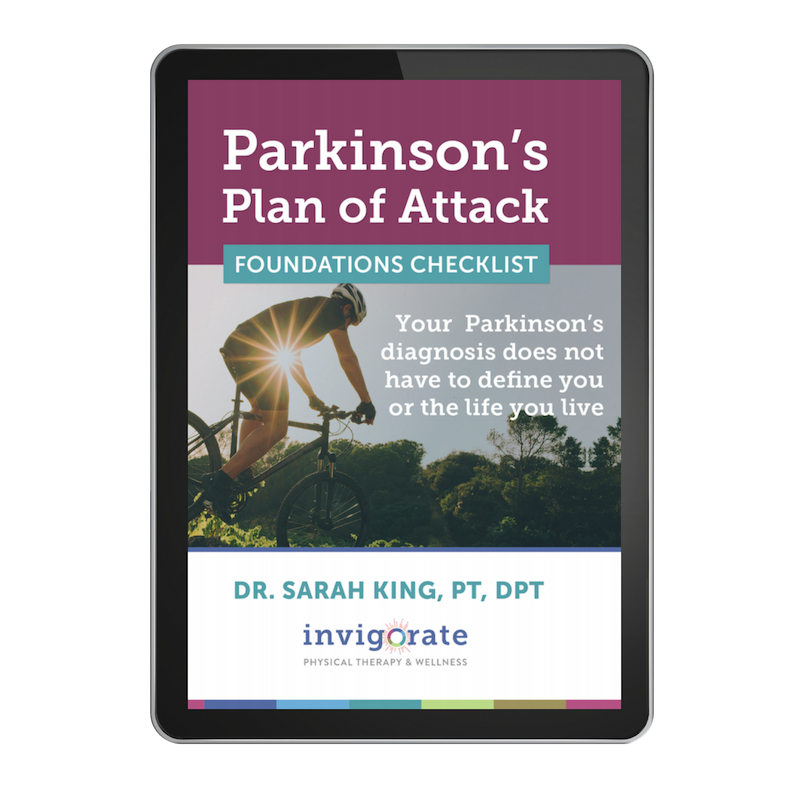 Below are my top recommendations for products to add to your Parkinson's Sleep Kit*. These are products I've tried and use myself and ones I recommend to my Parkinson's clients on a regular basis. Your brain is constantly cycling through different types of brain waves - beta, alpha, theta, and delta - depending on where you are and what you're doing. The higher frequency waves (beta and alpha) are typically occurring when you're mentally stimulated, and slower waves (theta and delta) are present with states of deep relaxation, meditation, and sleep. Brilliant neuroscientists from Northwest University are behind the website Brain.FM, and have studied how to use binaural beats from different types of sounds and music to induce desired brain waves depending on your activity. Simply select your preferred duration, put your headphones on, lay down, and the music starts to play automatically. I invite you to try Brain.FM tonight when you're slipping into bed. They offer a free 7-session trial so you'll be able to see if it really works for you before purchasing. If you find it helps your slumber, their memberships run between $4-7/month. ^^^Pro Tip: You can use sleep headphones (like these by Hibermate) at night if you have someone else in bed who doesn't want to listen to your sleep-inducing beats. Headphones actually improve the quality and effectiveness of the music. What's worse is that stress, caffeine, and some medications can accelerate the loss of magnesium. If you're having issues with any of the symptoms above, especially if they're affecting your sleep, you could likely benefit from a boost of magnesium. The best way to get more magnesium in your diet is to eat foods that are rich in magnesium. However, some people will still require supplementation to reach optimal levels*. The type of powdered magnesium found in Natural Calm, magnesium citrate, is a highly-absorbable form of magnesium and is easy to find on Amazon or at your local health-food store. Taking 1/2 tsp in warm water 30-60 minutes before you're wanting to fall asleep can be a good practice to help relax your body and take you into dreamland. *Check with your physician or healthcare team member before adding any supplement to your diet so they can make sure none of your current medications interact negatively. Ambient light and noise from outside can keep your body from completely shutting down and falling into a deep slumber. Specifically (nerd alert!) artificial light impairs your release of melatonin, your body's sleep hormone. When you're not producing enough melatonin, your body stays in a state of sleeplessness and prevents you from getting the deep sleep you need to repair your tissues from the hard day's work. Hanging a set of black-out curtains over your bedroom windows can be a game-changer for your circadian rhythm by blocking sleep-disturbing ambient light. ^^^Pro Tip: If you're someone who frequents the facilities in the night and needs to have some light to make that trip, check out this Low-Blue Nightlight that avoids using light that will mess with your melatonin. If you've read our previous articles about sleep, you're likely already aware of how blue-light from electronic screens (TVs, computers, iPhones, etc.) disrupts your circadian rhythm and throws a wrench in your body's ability to turn-off at night. Despite how much we try, however, sometimes we just can't get away from late-night TV or surfing the web later than we should. I'm the first one to admit that this is the hardest sleep-routine habit for me to break. So, what can we do if we just can't "unhook" from our beloved devices? Cue these oh-so-stylish blue-light blocking glasses by Uvex. Not only do they help block blue-light, they also help reduce eye-strain caused by continuous computer screen use. Slip them on as soon around sunset to help coax your body into a more restful state. ^^^Pro Tip: If you wear prescription glasses, the blue-light blocking glasses by Solar Shield fit over your glasses and can be worn together for only a few bucks more. "Who on earth would splurge for an alarm clock??" Listen up. There will be some of you who have the luxury of sleeping in and waking up at whatever hour of the day suits you. Congratulations on your retirement. For some of us, we're still committed to waking up before the sun rises, whether or not we're happy about it. (Can you tell I'm not happy about it?) Until I discovered the Phillip's Wake Up Light, my morning alarm felt like I was being ripped through the time-space continuum. My heart would race and I'd start the whole day startled. This alarm clock changed all that. Initially my husband bought it for him after reading about it's ability to help your body wake up when your sleep is the lightest, instead of ripping you out of bed with a shot of cortisol from your fight or flight system. How it works: You set the time you'd like to be awake by, and the alarm clock starts emitting a warm, low-light 30 minutes prior to your alarm time (simulating sun rise). That way you can slowly come into an awake state and feel more rested and peaceful to start your day. If you're really sleeping deeply, you can set a wake-up sound like birds chirping, jungle noises, or a few others to make sure you're up and at 'em when you need to be. This was a game changer in the King household. We bought 2 (one for each bedroom) as well as multiple as gifts for family and friends. So, if you're still fighting nature and up before the sun rises, you'd definitely benefit from using a wake up light alarm clock. You can find the Phillips Wake Up Light on Amazon here. You won't regret it, I promise! Do you have issues with sleep? What have you found to be the most helpful when it comes to dozing off at night?